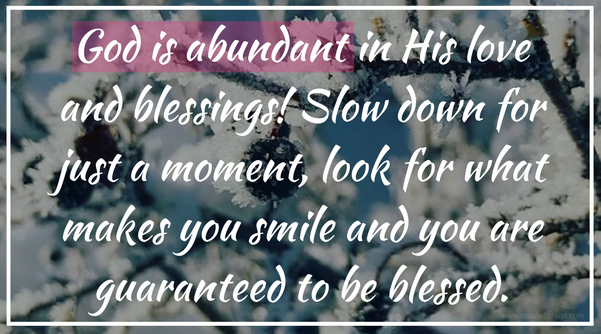 There are beautiful blessings all around you! It’s up to YOU to stop and see them. God is abundant in His love and blessings! 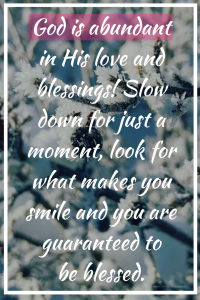 Slow down for just a moment, look for what makes you smile and you are guaranteed to be blessed. I am blessed by beautiful sunrises and sunsets, especially when it’s really cold. The horizons turn these incredible pastel colors that I can only imagine are glimpses of Heaven. Comment below and share one of your blessings with me. I want to know what you are blessed with! Get daily words and moments like these, by following me on Instagram and Facebook!